There’s nothing quite as inspiring as a blank notebook. We might be doing away with cursive handwriting and sending email rather than letters, but we still love a blank book full of empty pages that are waiting for our own words. The advantage of a notebook lies in its portability. It weighs less than a laptop, and is even thinner than a tablet. You don’t have to power it on, wait for a signal or connection or three bars or whatever else to make it work. It’s ready to go, and though it might run out of pages, it will never run out of power. You can refer to it without plugging it in. And you can make sketches quite easily. All you need is something to write with. 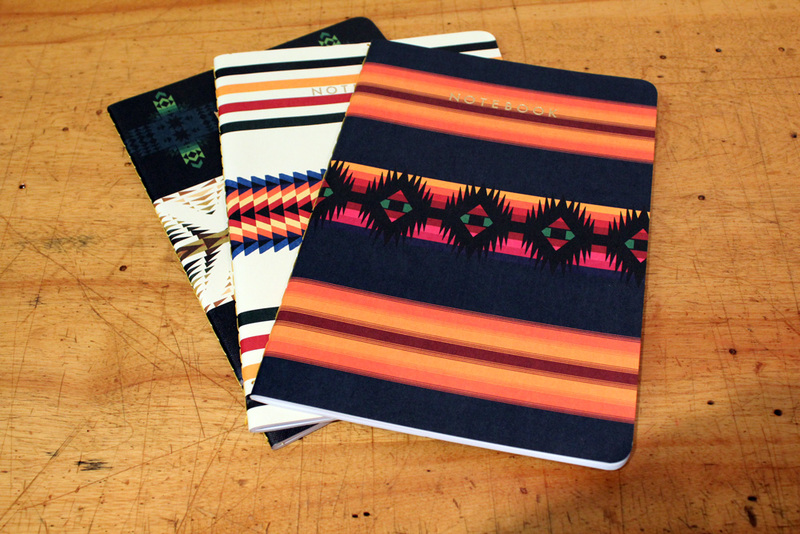 When you’re ready to record your deepest thoughts, your secret dreams or just some recipes and grocery lists, you can get your Pendleton notebooks here. The covers are based on our wool blankets, combining National Park Blanket stripes with Native American-inspired geometric patterns. The covers are sturdy, the books are stitched, and the pages are ruled. Just add a pen, and you’re ready to go. Happy inspiration, from Pendleton Woolen Mills.